SDSU offers a variety of living options tailored to students' needs and interests. 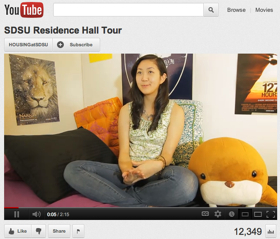 Benefits of living on campus also include friendship, involvement and fun — find out more at the On-Campus Housing site. 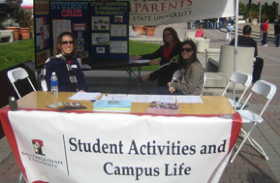 SDSU encourages all students to live on campus for at least 2 years while studying at SDSU. Research shows that students who live on campus for a second, third and even fourth year are more likely to graduate on time than their off-campus counterparts. In fact, students who live on campus have a 10-15% better chance of doing well in college! Why live on campus? Here's why! Find move-in help, important dates, info about residence halls and accommodations, and lots more about living on campus. Note: As of fall 2010, all admitted first-time freshmen from outside the local service area, as well as all first-time freshmen participants in the Weber Honors College, are required to live on campus. Problems related to campus housing? Contact the Office of the Ombudsman. Commute to campus? You're not alone! We can help you find a group of friends, a student organization, a research project, a mentor, or a community service event that will help make SDSU your home away from home. With Student Life & Leadership (SLL), you have a friend on campus to direct you — and connect you — to lots of ideas and resources. Getting involved is easy: Just contact SLL at (619) 594-5221, email sll@mail.sdsu.edu, or visit the SLL office in the Conrad Prebys Aztec Student Union, second floor, Room 210. If you commute to campus, Student Affairs provides important tools to help you make a positive connection to campus. 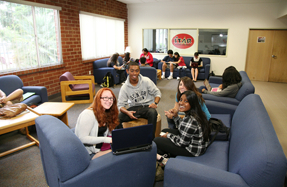 The Division of Student Affairs oversees the Residential Education Office and provides a variety of services to commuter students through the department of Student Life and Leadership. The division strives to enhance the living and learning environment for residential and commuter students, both inside and outside the classroom. Learn more. Over 85% of today’s college students live off-campus. Take the steps to develop a sense of belonging to the SDSU campus: visit the Commuter Resource Center page.